There's not much more that can be said about Triumph's triple cylinder engine. It was already a blinder in the street Triple and 675 but the increase in stroke (and subsequent capacity) for the Tiger has beefed up the mid range torque making it an ideal motor for a middleweight adventure bike. 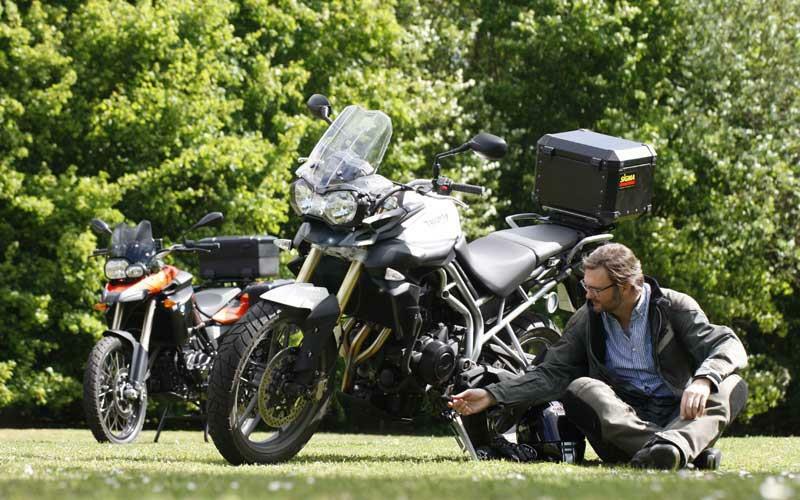 R1200GS and KTM Adventure riders may scoff at the Tiger's 799cc engine capacity but for 85mph two-up touring it's vibe free, flexible and you don't need anything bigger, something I aim to prove on a trip to Spain in August. My commute is 95% motorway so the Tiger spends most of its life at around 80-85mph returning a decent, if not unexceptional, 50mpg. Go much over 90mph though and the fuel consumption plummets horrendously to 36mpg, returning just 150 miles from its 19 litre tank. Almost. Windblast from the shortish screen buffets my lid a little and the bars are slightly too far back for my long reach (I'm 6'4") but other than that it's roomy and comfortable. I tried loosening the handlebar clamps and rotating the bars forward but this only has a limited effect. Plus as the bars are rotated they begin to angle inwards in a shallow V. I have a pair of tapered Magura bars somewhere in the garage with a lower rise so I'll try those. Almost. In all of the road tests the Triumph has featured in, the Tiger has come under some criticism for being a bit dull. But you've only got to ride the Tiger alongside the two BMW F800 models to realise that in it's class, it's the most exciting motorcycle currently built, largely thanks to that engine. It's only beaten in the excitement stakes when more expensive (and possibly more fragile) bikes are added to the mix like the KTM SMT and Multistrada. P.S. I mentioned in my last report in print that as the Tiger has a 19inch front wheel I was keen to fit the confidence inspiring Dunlop Roadsmarts that I had on my XR1200X long termer last year (also a 19inch front). Unfortunately, Dunlop don't make the Roadsmarts in the Triumph's 100/90 size so I stuck with trail style rubber.